There is possible Tropical low developing hear the NT. This may go into the WA or NT/GOC. See more click onto here. The Tropical Monsoon is developing out to sea at the moment need to be watch over the coming few days. A bit of an new weak low. for the period until midnight CST Saturday 29 December 2018. A weak tropical low is located over the Arafura Sea and is expected to track westwards into the Timor Sea over the next couple of days. The low is not expected to develop significantly, though the environment becomes more favourable for development from Friday. In the longer term, the monsoon trough is expected to form and deepen in the region over the weekend. There is potential for development of another tropical low within the trough, though the location of formation of this low remains uncertain. FV3 wants to take low pressure to coral sea at about 168hrs on 00z run today. It has been trying to stir up coral sea for 4 days or so now. Lead time is too far for my liking of any models though. So I will just look at the quidge for a while. It’s an interesting week ahead as any low that develops will head west initially and then, depending on the monsoonal flow strength, may turn back east. I have little doubt that the next ex-TC or 2 will traverse the inland given the upcoming heat, which will have to break somehow. ACCESS g has the GOC TC tracking east onto the far nth tip coast( 126e 12 s) on 2nd Jan.
for the period until midnight CST Monday 31 December 2018. A tropical low [1003 hPa] is located over the Timor Sea. The low is expected to move southwest over the next couple of days. The risk of development into a tropical cyclone remains Low to Very Low. During Sunday, another tropical low may be located in, or near the Gulf of Carpentaria embedded within a developing monsoon trough. The environment is favourable for further development provided the low remains over water. There is currently a degree of uncertainty whether the tropical low will be located in the Gulf of Carpentaria or in the Coral Sea. Cyclone Watch has been issued for the west coast of the Peninsula. Kowanyama to the Torres Strait Islands. Intensity: Tropical Low, sustained winds near the centre of 30 kilometres per hour with wind gusts to 85 kilometres per hour. Location: within 75 kilometres of 13.2 degrees South 142.9 degrees East, estimated to be 130 kilometres east southeast of Weipa and 130 kilometres east of Aurukun. Movement: west at 13 kilometres per hour. The tropical low is forecast to deepen today while moving in a westwards direction across Cape York Peninsula. 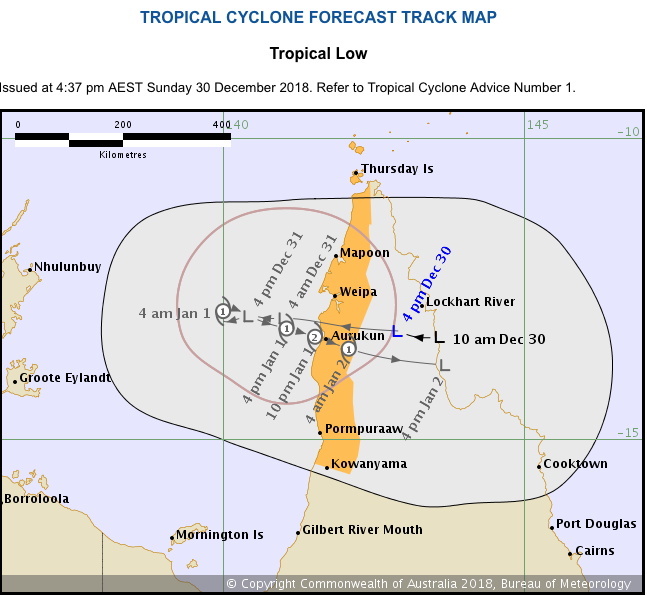 The tropical low is expected to intensify as it moves over Gulf of Carpentaria waters on Monday and at this stage it is rated a high chance of forming into a tropical cyclone on Tuesday. GALES, with peak gusts in excess of 90km/h, are expected to become more likely across far north Queensland into Monday, particularly about Torres Strait and Cape York. Depending on the movement and development of the tropical low it is possible that these GALES may extend southwards to Kowanyama on Tuesday. HEAVY RAINFALL, which may lead to flash flooding, is likely across far north Queensland over the next few days. TIDES are expected to become higher than predicted through Torres Strait over the next couple of days and it is possible that some islands may see water levels that approach the Highest Astronomical Tide on the high tide on Monday and Tuesday. A Flood Watch remains current for coastal catchments north of Cardwell, including catchments across the Cape York Peninsula. A separate Severe Weather Warning is also current for far north Queensland. 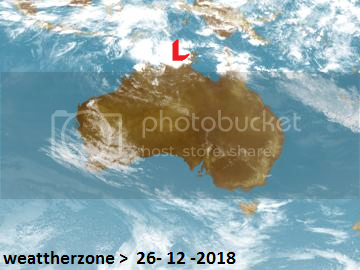 ACCESS g 7 day forecast has a tropical low connected to the monsoon trough, forming over the top end. Saturday 5th jan .
for the period until midnight CST Wednesday 23 January 2019. A trough extends over waters north of the Top End and the Cape York Peninsula. This trough is expected to strengthen into a weak monsoon trough by Monday. A weak tropical low, 1007 hPa, is currently located within this trough in the Arafura Sea. The low is expected to slowly strengthen, move towards the southwest, and is likely to be in the Western Region by Wednesday. Another tropical low may move into the northern Gulf of Carpentaria during the next two or three days. 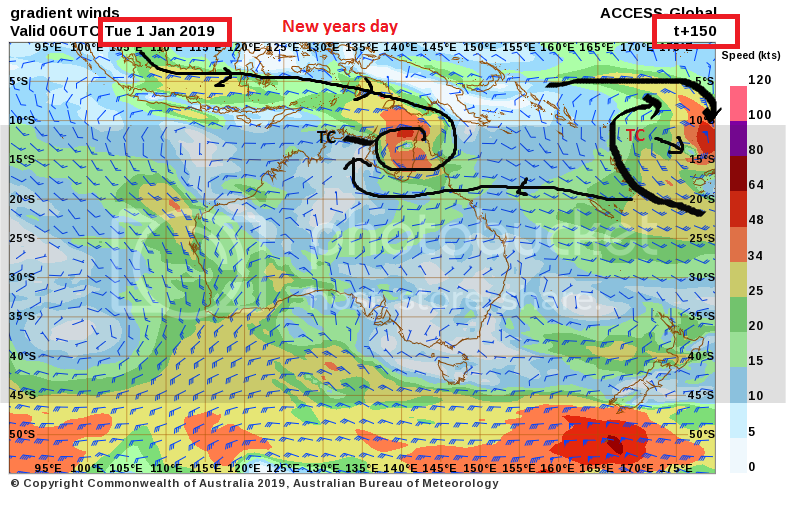 ACCESS G has a tropical, storm / INVEST emerging on its forecast for Friday the 25th Jan .
ACCESS suggesting could be a TC as soon as sunday the 27th jan.
for the period until midnight CST Saturday 26 January 2019. Each way bet on which side of the Cape it ends up on that forecast. Mornington Island to Mapoon, including Weipa, Burketown, Normanton and Kowanyama. Location: within 35 kilometres of 12.0 degrees South 140.9 degrees East, estimated to be 135 kilometres northwest of Weipa and 550 kilometres north northeast of Mornington Island. Movement: southwest at 9 kilometres per hour. The tropical low is expected to intensify into a tropical cyclone in the next day or two as it moves slowly to the south. Gales are not expected to develop along the coast in the next 24 hours, but may develop between Mapoon and Gilbert River Mouth overnight Friday or Saturday morning and extend south to the remainder of the Watch zone later on Saturday. People between Mapoon and Mornington Island should consider what action they will need to take if the cyclone threat increases. - Information is available from your local government. This one will be named Savannah according to wiki, and could be a saviour for many farmers up north. The rainbands on the 256km Weipa radar showing up some good rotation .The core looks to be west of Weipa over water. Gee that could look quite good on sat pic' as that TC builds .